Our signature HIGH PRIORITY GRAM™ was conceived with efficiency and speed in mind, allowing you to communicate with your audience at a moment’s notice without the typical headaches surrounding a traditional direct mail appeal. So when the next crisis hits, be the first to reach your audience with a high impact HIGH PRIORITY GRAM™. All you have to do is send us your data & text, and we’ll take care of the rest for you. It’s as easy as 1, 2, 3! 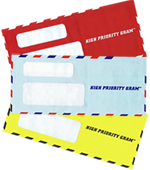 (1) Carrier Envelope: #10 double left window HIGH PRIORITY GRAM™ envelope. Your choice of Red, Blue, Yellow & Plain White. (2) Letter/Reply: 8.5x14 60# plain white offset with a full horizontal perforation at the reply. (3) Reply Envelope: #9 center window 24# White Wove BRE or CRE. (1) Data Processing: Convert, format & presort 1 file for First Class, Standard or Non Profit rates. (2) Personalization: Format & layout letter/reply which lasers duplex (front & back) in black ink. (3) Mail Shop: Double parallel fold letter/reply in fourths, insert two components, seal, sort, tray & mail via meter or stamp.